Zhang Daqian (張大千, 1899-1983), original name Zhang Yuan (張爰) and pseudonym Daqian, was one of the best-known and most prodigious Chinese artists of the twentieth century. He is also regarded by many art experts as one of the most gifted master forgers of the twentieth century. He excelled at all types of paintings, and is especially famous for his landscape, as well as lotus paintings. As a child, Zhang Daqian was encouraged by his family to pursue painting. In 1917 his elder brother, Zhang Shanzi (an artist famous for his tiger paintings), accompanied him to Kyoto, Japan, to study textile dyeing. Two years later, Zhang Daqian went to Shanghai to receive traditional painting instruction from two famous calligraphers and painters of the time, Zeng Xi (曾熙) and Li Ruiqing (李瑞清). Through his association with these teachers, Zhang had the opportunity to study some works by ancient masters in detail. His early style attempted to emulate the Ming-Qing Individualists, including Tang Yin (唐寅), Chen Hongshou (陳洪綬), and Shitao (石濤). He meticulously studied and copied their works and began to make forgeries; his paintings after Shitao successfully deceived some of the best connoisseurs. After his early success in Shanghai, Zhang extended his career to the north in the late 1920s, when he became active in the cultural circles of Beijing. He began to collaborate with the well-known Beijing painter Pu Xinyu (溥心畬), and together they became known as the “South Zhang and North Pu,” an epithet that is still used to refer to their collaborative works of the 1930s. In 1940 Zhang Daqian led a group of artists to the caves of Mogao (莫高) and Yulin (榆林) for the purpose of copying their Buddhist wall paintings. The group completed over 200 paintings, and the experience left Zhang with a repository of religious imagery. During the Sino-Japanese War, the artist zealously studied traditional Tang-Song figure painting and ancient monumental landscape painting. His love of tradition was also reflected in his personal collection of ancient Chinese paintings, which he began early in his career. At its peak, his collection contained several hundred works from the Tang to Qing dynasties. Zhang Daqian developed eye problems in the late 1950s. 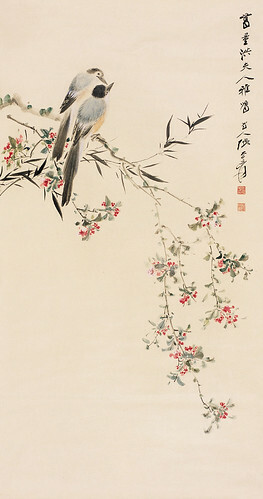 As his eyesight deteriorated, he developed his mature splashed color (pocai, 潑彩) style. 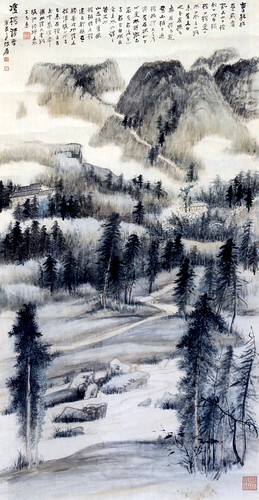 Although he attributed this style in part to the splashed-ink technique of the ancient painter Wang Mo (王墨, ?-805, also known as Wang Qia 王洽), many believe it to be related to that of the Abstract Expressionist movement then popular in the United States and a departure from that of his traditional paintings. Zhang’s splashed-color paintings fetched the highest market prices for contemporary Chinese paintings at international auctions of the time. In 1978 the artist settled in Taipei, Taiwan. His residence, Moye Jingshe (摩耶精舍), next to the National Palace Museum, is now the Memorial Museum of Zhang Daqian.